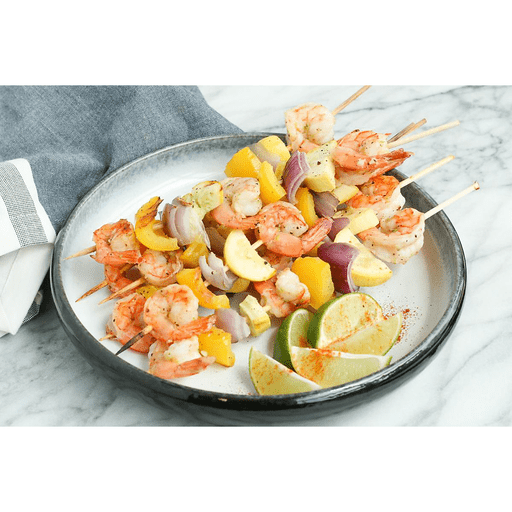 These simple Grilled Garlic and Black Pepper Shrimp Kabobs are packed full of flavor and fresh veggies. The kabobs take only minutes to put together and are perfect for summer grilling. 1. Soak wooden skewers in water for at least 30 minutes. 1. Heat grill to medium-high heat. Clean grates well, then brush with oil. 1. In a large bowl, whisk together chile, garlic, black pepper, lime juice and vegetable oil. Add shrimp and toss to coat. 1. Thread shrimp on to skewers, alternating with bell pepper, onion and yellow squash. 1. Grill shrimp, turning once, until cooked through, about 6 minutes total. Serve with lime wedges and a sprinkle of paprika, if desired. Per Serving: Calories 180, Total Fat 5g (Saturated 1g, Trans 0g), Cholesterol 215mg, Sodium 970mg, Total Carbohydrate 9g (Dietary Fiber 2g, Sugars 3g, Includes 0g Added Sugars), Protein 24g, Vitamin D 0%, Calcium 8%, Iron 6%, Potassium 8%. *Nutritional values are an approximation. Actual nutritional values may vary due to preparation techniques, variations related to suppliers, regional and seasonal differences, or rounding.